Great News, Foodies! The Easter Island Heads Are Starting To Mumble Delicious Recipes You Can Make At Home! One of the classic foodie dilemmas is finding enough time in your busy schedule to cook food that meets your high culinary standards. But it looks like that problem might have just been solved! The gigantic stone heads of Easter Island have started to mumble delicious recipes that you can make at home with ease! The Easter Island heads, known as moai, were first reported to be muttering quick, healthy recipes under their breath last week, when a team of anthropologists overheard one of them say, “You’re gonna want to let the whole mess simmer for about 10 minutes.” The statue was in the middle of muttering the recipe for a white bean and chorizo soup! The researchers soon realized that all of the moai were mumbling recipes! Once they finish mumbling one recipe, they get quiet for a few minutes, and then begin mumbling another. This recipe only takes 20 minutes to prepare! This is one of our favorite recipes that any Easter Island head has mumbled so far! All of the Easter Island heads screamed the recipe to this one in unison during an eclipse! Anthropologist Kirsten Madsen of Columbia University reported that this discovery was extremely exciting for foodies everywhere. Dr. Madsen has stated that although the Easter Island heads will occasionally mumble the dates of historical disasters such as the sinking of the Titanic and the crashing of the Hindenburg, as well as future dates when terrible disasters as yet unknown will almost certainly occur, they are chiefly mumbling some of the most convenient and tastiest recipes around. 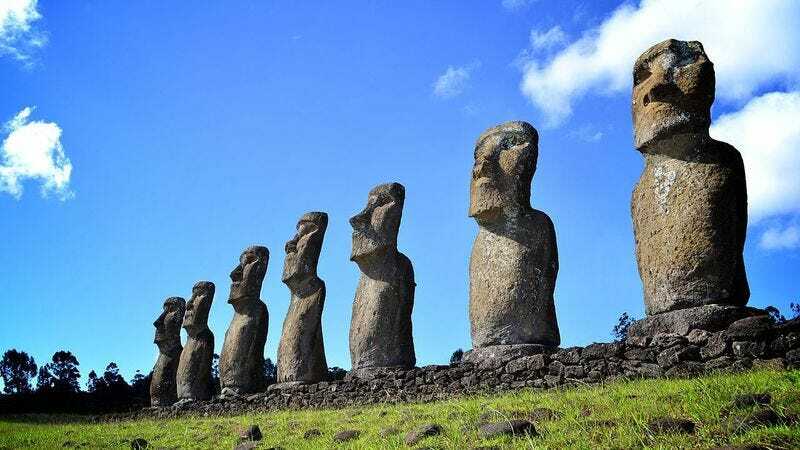 If you make it out to Easter Island and try out any of the recipes these giant stone heads are mumbling, be sure to tell us how you like them! This is such an exciting time to be a foodie!